Do you have a new dryer? If not, you might be surprised to learn how far the technology has progressed since your last purchase. 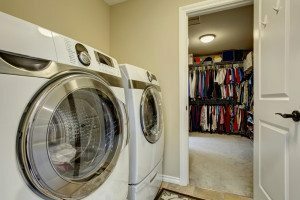 These days, choosing a dryer isn’t just about capacity and moisture sensors. Those may be important considerations, but the latest clothes dryers incorporate exciting special features that can help you get a lot more out of the appliance. Take a look at some of the interesting features you can find on the most advanced new dryers available today. One of the newest developments in dryer technology, steam cleaning cycles help remove stains and odors from laundry. Have an item of clothing you only wore once? Refresh it and remove wrinkles by running it through the steam cycle — no dragging out that ironing board or clothes refresher spray. The steam cycle can also be used to launder items that are not suitable for cleaning in the washing machine, such as stuffed toys, duvets and pillows. Some models even have a steam/sanitize setting that can remove germs and bacteria from laundry, a feature useful after someone in the home has been ill or if you’ve been exposed to bedbugs. Interested in saving on energy costs? You might want to consider a heat pump dryer. These models use up to 40 percent less energy than standard Energy Star dryers. Most conventional clothes dryers generate heat through electricity or gas, venting the hot air outside through a hose. With heat pump dryers, however, the hot air isn’t vented outside. Instead, the heat is recaptured, the moisture is removed, and the hot air is pumped back into the dryer. Heat pump technology is the latest cost-effective, energy-saving feature to be introduced. If you want the gentleness of drying laundry outside on the line with the convenience of using an automatic clothes dryer, consider a drying cabinet. These electronically heated cabinets do not tumble clothes in a drum like traditional dryers. Dryer cabinets have rods and racks inside where you can lay or hang clothing to dry. Available in wall-mounted or floor-standing models, these new dryers are ideal for delicate laundry. They also work well for drying items that are not suitable for a conventional clothes dryer, such as shoes and hats. Dryer cabinets save energy too, as they require less heat than a tumble dryer. The main disadvantage is the extra room required to accommodate the cabinet. Appliance manufacturers are continually developing new technology, and Complete Appliance Repair would love to tell you more. If you would like more information on any of the latest clothes dryer features, contact us today. Providing the premier appliance sales, installation, maintenance and repair in the Salt Lake City area, we can help you with all of your new dryer needs. This entry was posted in Blog and tagged New Appliances, New Dryer Features on September 23, 2015 by admin.